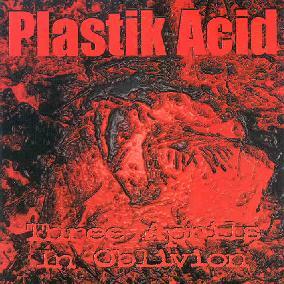 Plastik Acid - "Three Aprils in Oblivion"
Forget outer-space. Hell, this ain't even inner-space... more like inner-claustrophobia, if anything. The last thing I expected to receive for review from AI was a "death/doom metal" album, but that's the closest label I can think if I had to make up a quick classification for this arrival, though it hardly hits the mark perfectly (as genre-labels never do, of course). Anyway, to be more specific, the music features down-tuned heavy doom riffs and dark, depressing lyrics in the early Paradise Lost/My Dying Bride mode (circa early '90s), though with less of the gothic element and more of a touch of industrial dread. The vocals are sometimes clean but often growly, though not in the incomprehensible/inhuman style of typical death-metal, which wouldn't make sense anyway, since the main theme here is about human suffering... plus, Chris Bentley has a rather distinct and powerful voice of his own. The lyrics relentlessly grind through various states of violence, emotion and brutal existential introspection. There are few long instrumental passages, so the vocals/lyrics are integral to the music and the mood. The album opens with a short piece called "Sunset", which starts with a sample of some (relatively) cheery French music which is gradually overcome by noise. Following is PA's (from Detroit, by the way) first dirge, "Dead Inside", which begins with a hypnotic, off-kilter clean-guitar riff and clean vocals, before the heavy guitars, anguished vocals and chamber-haunted death-drums kick in. "Hands of God" is another stand-out tune with more doom-metal guitar, angry vocals and a strikingly brutal industrial synth blast on the beat of the chorus. Next is "Locust Rising", a simple but powerful piece, featuring semi-spoken vocals that actually recall Jim Morrison somewhat and more anti-Christian overtones before things get heavy again. "Devour the Skin" is perhaps the most frightening piece of all, with lyrics describing a self-hating individual whose anger turns outward and results in murder, witnessed by the narrator who repeats "I saw what you did". The quieter parts emphasize the daunting doom-drum and lyrics, so simplicity is again used to good effect. Things speed up and get more intense once the antagonist assumes narration and we're treated to a horrifying booming synth effect similar to the one in "Hands in God". "Leprosy" starts off with chunky guitar and shouted, almost-punkish vocals before the chorus thrusts you into the dark corridor that shouts "I am a child of agony" in all seriousness and no irony. "The First Wasp" begins with a disturbing ambient "dark-wave" phase in the starkest of the early Tangerine Dream tradition, accompanied by cymbal-washes and subtle industrial sounds before segueing into a typical PA death-obsessed dirge. "Sweet Aries" closes the album with a quiet, haunting love-song melody, though of course the love by this point is dead. Highly recommended for early-'90s doom-death aficionados and those looking for dark music in a different vein than the usual kinds described in this zine. Three Aprils In Oblivion is distributed by Cerebrum Records. You can email them at cerebrumrecords@yahoo.com. Contact via snail mail c/o Cerebrum Records; PO Box 9312; Canton, OH 44711. Phone: 330-455-9787.